Like battle start events, you can set up the battle end events for each battle system type individually – and each battle can override those default events as well. This way you can, e.g. add a dialogue at the end of a special battle. Battle end events are in charge of collecting the battle gains (loot, experience reward), playing victory music, removing any combatants that aren’t necessary any longer and return to playing the previous music. The player group won the battle. We most likely want to collect our rewards. The player group escaped the battle. Just get the hell out of there, forget the rewards! You’re dead … game over? But first, let’s add another camera position. We need another camera position to show a good front view of our player when he won the battle. You can read more about them in this how-to. Open the ORK Framework editor and navigate to World > Camera Positions. Add a new camera position and change the following settings. We don’t want to look at the combatant’s feet. We always want to look at the front of our combatant. Set to X=0, Y=1, Z=5. In most situations we don’t really need to set the Field of View, but it doesn’t hurt, and you never know if a previous camera position changed it. That’s it for this camera position – click on Save Settings. Now it’s time to create a battle end event in case we won a battle. Navigate to Events and create a new battle end event by clicking on New Battle End Event. Now we’ll play the victory music we set up earlier. Let’s face our player! We currently only have one combatant in our player group, but for future expansions, we want the camera to look at each member of the player group for some time. This will allow us to use the whole player group participating in the battle. Allows us to use the camera position on all group members in sequence. We’ll display a simple message to state that we’ve won. This will collect all gains (loot, experience) from the battle. 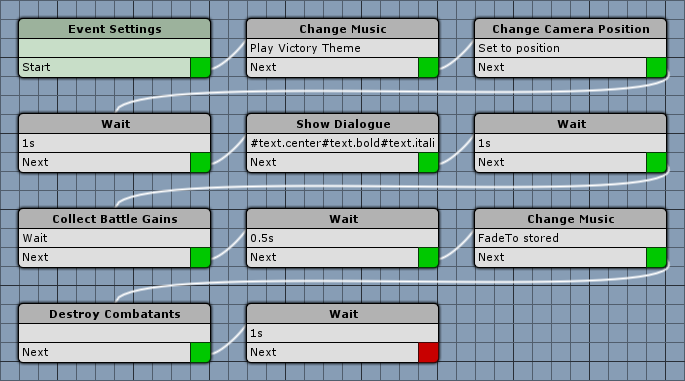 Displays a dialogue with our battle gains and level up notifications (if someone reaches a new level). The GUI box and text are set up in Battle System > Battle End. Continue playing the stored music. This step will remove all game objects of combatants we don’t need from the scene. We don’t want to destroy our player’s game object. That’s it for this event – click on Save Event and save it as simpleVictory in Assets/Events/Battle End/. We aren’t using escape yet, but let’s quickly create a small escape event. Click on New Battle End Event. We’ll display a simple message to state that we’ve escaped. Select a black color with no alpha (R=0, B=0, G=0, A=0). Select a black color with full alpha (R=0, B=0, G=0, A=1). The player escaped, so he shouldn’t get anything … no further settings. And that’s it for this event – click on Save Event and save it as simpleEscape in Assets/Events/Battle End/. When the player group has been defeated, we want to end the game and call Game Over. Click on New Battle End Event to make that happen. Fade out the music, the game is over. This steps ends the game and loads the game over scene – something that we still have to set up! The game over step ends the event, no further settings. And that’s it for this event – click on Save Event and save it as simpleDefeat in Assets/Events/Battle End/. For our game over step to do the correct thing, we need to set up the game over settings. 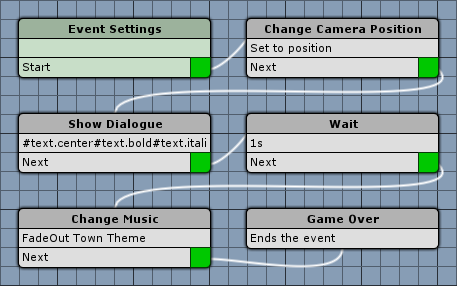 We can define the scene that will be loaded, the fade out/in when loading the scene – and if a game over menu should be displayed. Navigate to Game > Game Settings and change the following settings. Set to 3 Game Over. We want to fade out the screen (to black) for 3 seconds. Select a black color with no alpha (R=0, G=0, B=0, A=0). The scene will be changed after the fade out – and we want it to fade in again. Finally, we want to display a the game over menu with Retry, Load and Exit options. The retry option will load the last saved or loaded game, or a retry save game if available. Retry save games are temporary save games that are only available in a running game – if the player exits the game, the retry save game is gone. This will call the load menu – something we also still have to set up to our liking, but the base settings are enough for now. This will load the main menu scene. That’s it for the game over settings. 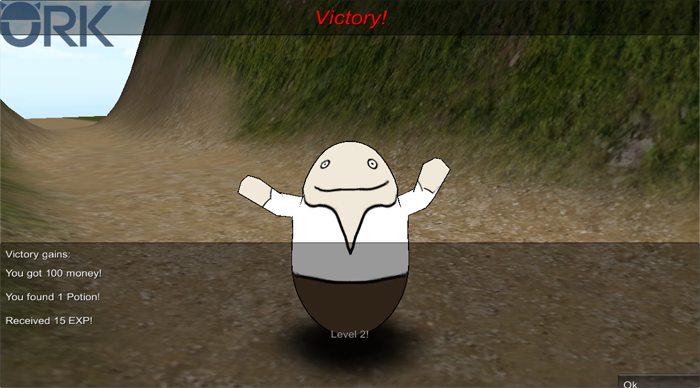 Now all we need to do is add the battle end events we created to the Turn Based Battles. Navigate to Battle System > Turn Based Battles and change the following settings. Test it, and see how it ends! Again, open the main menu scene (0 Main Menu) and hit Play. Walk outside of the town and into the battle – and see how your battle ends for you. Tip: If the battle is to hard for you, you can always change some of your player’s or the enemy’s status values – or simply add a bonus to MaxHP to your player’s combatant. We’re still missing some things – like animating the Defend or Escape command … or Death. And that’s it for now – the next lesson will cover animating those special actions.